Ontonagon County is a big county. Part of the county encompasses most of the Porcupine Mountains State Park and half of the largest lake in the U.P. On it also contains one of my favorite waterfalls, Bond Falls. On any given summer day in Ontonagon County you can see bikers pouring up from Wisconsin or crisscrossing the U.P. on Hwy M-28. Bond Falls Road is a fun road to motorcycle for three reasons. First its great two lanes of blacktop winds you through the the woods to one of my favorite U.P. waterfall, Bond Falls. Secondly when you reach the falls, you can treat yourself to a tasty ice cream cone while you sit on a park bench on a warm sunny day and relax after a long days ride. One of the best known sights in Ontonagon County is Lake of the Clouds at the north end of the Porcupine Mountains State Park. Probably my favorite U.P. 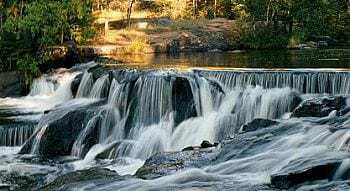 waterfall is Bond Falls which is located east of the little town of Paulding just off Highway 45. Get a warm sunny day during Color Season and it’s one place you just have to see. Well known Motorcycling Hwy M-26 gets its start just north of Mass City, but I suggest a ride on the South Boundary Road between the north and south end of the Porcupine Mountains State Park. Also a cruise around Lake Gogebic makes for a nice ride. In the Town of Ontonagon, you’ll find some great places to stay on Lake Superior to drop your kickstand. Most of them have private beaches and if you’re lucky you’ll catch a night with a sunset that will have you thinking you’re in the Florida Keys.